Buy Creative Nature Apricot Kernels - 300g in the UK from our online shop or directly from our independent Scottish store. These apricot kernels are ideal for making your own face masks or body scrubs. 100% raw apricot kernels and nothing more! These raw apricot kernels are a cosmetic ingredient used to make natural face masks and exfoliating body scrubs. Creative Nature's apricot kernels contain approximately 150mg/kg amygdalin content. Not for internal use, these apricot kernels are not a food product. 100% raw apricot kernels and nothing more! We sell real Creative Nature and other Body Lotions, Oils & Scrubs directly from our shop in Scotland and online throughout the UK. View more products from Creative Nature. Where can you buy real Apricot Kernels safely online? If you are wondering where you can buy Creative Nature Apricot Kernels - 300g safely online in the UK, then shop with us. We are an actual health foods shop; with real people selling real foods and products. Our award-winning independent shop is located in Stirling, Scotland since 1976. You can buy our Body Lotions, Oils & Scrubs in store or safely place an order with us online or over the phone. 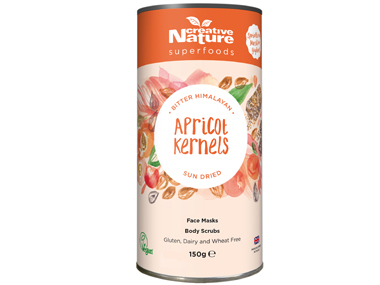 Apricot Kernels - Creative Nature Apricot Kernels - 300g in Body Lotions, Oils & Scrubs and Personal Care.